Well the last 8 days have certainly been eventful. Things really kicked off and, even though its mostly over, no ones sure why. In a sense, its surprising something didn’t happen sooner, there’s been so much anger brewing. Somehow though this felt different from anything we’ve had before… the looting I can understand, getting something for nothing is an appealing prospect if you don’t mind relinquishing your scruples. 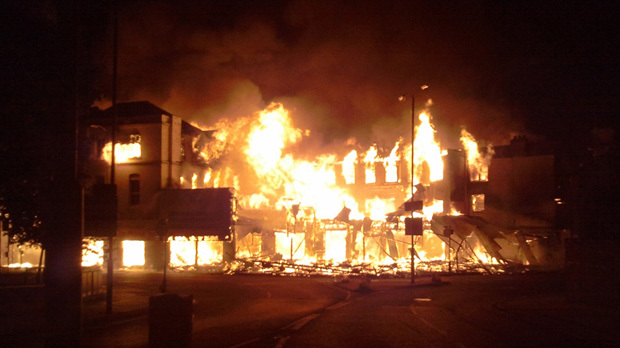 Its the fire that get’s to me, loads of them were set in shops with homes above them. I kind of shudder to think what exactly people would get out of that. The targets were really random too, not exactly a hitlist of hatred: a party shop, a furniture warehouse, a co-op. I’m working in Croydon at the moment and driving past some of burnt out wrecks every day has been strange, to say the least. Its peoples reactions to whats happened that I think I find most disturbing. The warehouse, pictured above, that was plastered all over the news is just by the Croydon flyover, a dual carriage way on my way to work. The morning after it was burnt I drove past and two of the lanes were full of about 50 cars just parked up there. Everyone had got out of their cars and were leaning against the crash barriers, watching the last of the flames and taking pictures. I drove past and was boggled, it was a horrible sight and definately not a spectator sport. I would have stopped to take a picutre but umm, you see the problem. So strange times indeed, and almost certainly not over even if this episode has petered out. That level of anger isn’t quelled easily and if politicians and police handle what happens next badly then it will all start again (although at least there would be an identifiable reason then).